This is a little mini recipe and a weekend update to let you know what’s happening over on this here blog. Firstly, radishes. 4. 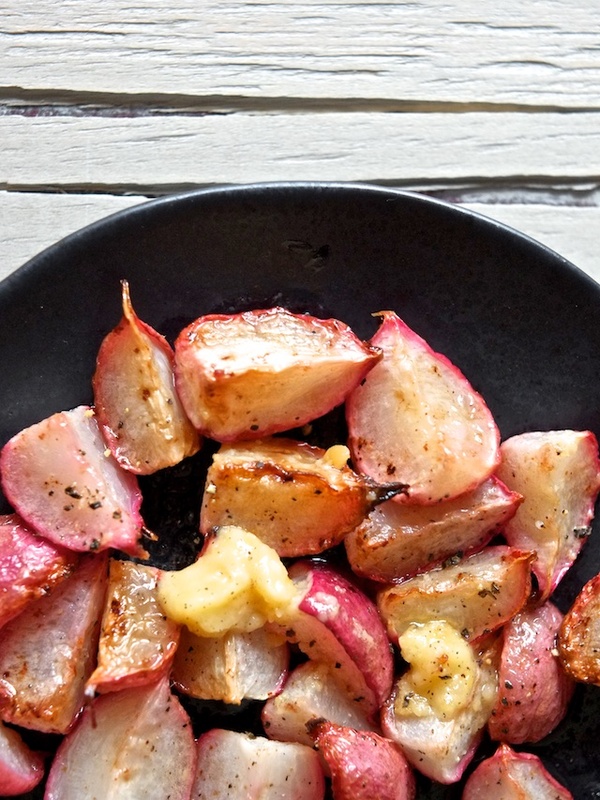 Cut the tops off your radishes, slice them in halves or quarters, spread them on a baking sheet and throw on some blobs of miso butter. Roast at 400 until the radishes are browned and soft. Add pepper and taste, then add salt if it’s needed. My Salted Brown Butter Vanilla Bean Crispy Treats were featured on Buzzfeed (eee!!) which is a big deal for a little old blog like mine, so I’m being devious and trying to hook a few new readers with a Le Creuset cast iron skillet giveaway over on that post. Because I love my regular readers more than anything, I’d especially enjoy giving the fancy pan to one of you, so go and enter! All you have to do is leave a comment (over on my original post) and follow me on instagram (which many of you already do, so you’re half-way done). I post to instagram maybe weekly and mostly photos of food, so it should be pretty enjoyable for all involved.